The musical collaboration between Evelyn Glennie and Trio HLK is a relatively new one, but it is already reaping very rich rewards. Last year the celebrated percussion soloist was invited by the experimental trio of pianist and composer Richard Harrold, 8-string electric guitarist Ant Law and drummer Richard Kass to perform in two pieces that would eventually be destined for the trio’s debut album. She readily accepted the request. 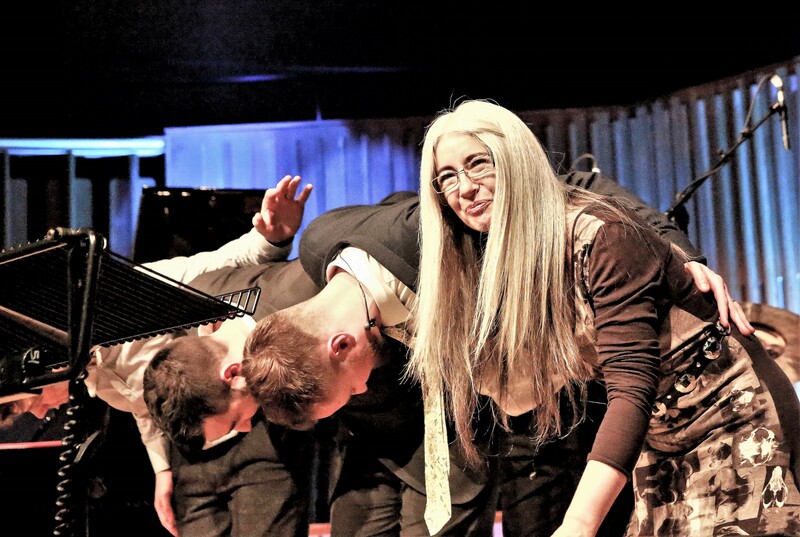 The album Standard Time was released back in May and now Evelyn Glennie and Trio HLK are out on the road performing material from that record. And the live experience is something that is pretty damn mesmerising. As Richard Harrold explains, the ensemble take what are often very familiar jazz standards and turn them into something that is completely different. In this alchemic process the musicians see just how far they can go. And the answer on this evidence alone is very far indeed. HLK start with a trio piece – their remarkable improvisation of Dorothy Fields and Jerome Kern’s 1936 classic ‘The Way You Look Tonight’, replete with trademark twisting time signatures and seismic polyrhythmic curves – before Evelyn Glennie joins the three men on stage for ‘Smalls’, a composition built around the nucleus of the melody from American jazz pianist Bill Evans’ ‘Blue In Green’. Surrounded by her customary phalanx of percussive instruments – vibraphone, marimba, plus assorted timpani and chimes – Evelyn Glennie immediately and seamlessly becomes part of the overall sound. She adds further warmth, resonance and energy to the already sparkling, undulating invention of harmony, melody and rhythm. What the four musicians create together is something that moves way beyond both time and place. The first half of the evening’s performance concludes with their interpretation of iconic jazz saxophonist Wayne Shorter’s ‘ESP’. ‘Extra Sensory Perception parts i and ii’ begins with a beautiful, delicate piano and vibes duet between Harrold and Glennie before escalating into a fierce tectonic battle as guitar and drums enter the experimental fray. Evelyn Glennie returns after the interval to perform alone on the Halo Drum (one of the hand pan family). Resembling some sort of inverted spaceship, the instrument in Glennie’s fluid hands achieves cosmic status as she caresses and cajoles the drum into effervescent effect. The three men then rejoin Glennie and together they all shift through a range of dazzling musical gears, veering off at often death-defying tangents into the worlds of Latin jazz and complex Cuban rhythms (as firmly evidenced by Kass’s staggering drum solo on ‘Dux’) and bold shades of neo-classicism (on the concluding ‘The Jig’, a piece which took its lead from Johann Sebastian Bach’s first Cello Suite). Together Evelyn Glennie and Trio HLK create a sound that pushes at the very boundaries of contemporary music. It is a deconstructed sound that is highly unpredictable, often complicated and always enigmatic yet still somehow manages to remain most accessible and undeniably easy on the ear. To achieve this incredibly difficult balance is firmly down to the skill, dexterity and innovation of these four incredible musicians.